There was a small price to pay when visiting Mother. Her television set was always set to FoxNews. Keep in mind that over Mother’s desk hung a frame displaying a letter addressed to ‘Jim and Gerda’ thanking them for a Christmas card. This letter was signed by George W. Bush. It’s the part where ET is going to the refrigerator. He comes across container of yogurt opens it and swallows a mouthful. Then suddenly, with a high and particularly loud, nasally pitched shriek of disgust he whips the yogurt container back into the fridge, creating an unholy mess. Now, that is exactly how I feel every time I watch FoxNews. The only difference is that I have never thrown food at a television while it’s on. The first couple of visits were rough. I think that I only flinched once, maybe twice each day. And eventually, Mother learned to keep her political comments to herself. I followed suit. And so, while Fox News played in the background there was very little discussion between Mother and I. We just sat and listened. The only thing was that I always tended to knit a little faster while the Fox co-anchors went through their anti-Obama spiel. As time went on I was able to build a thicker skin thanks to pundits Jon Stewart and Stephen Colbert. In fact, during my last few visits to mother she was gracious enough to offer to change the channel to CNN. I thanked her for her consideration but I told her it was fine, she could leave the TV channel set to FOXNews. I was beginning to find it amusing. Mother once even mentioned that she loved watching my facial expressions as I listened to the news anchors dribble their way through the daily headlines. 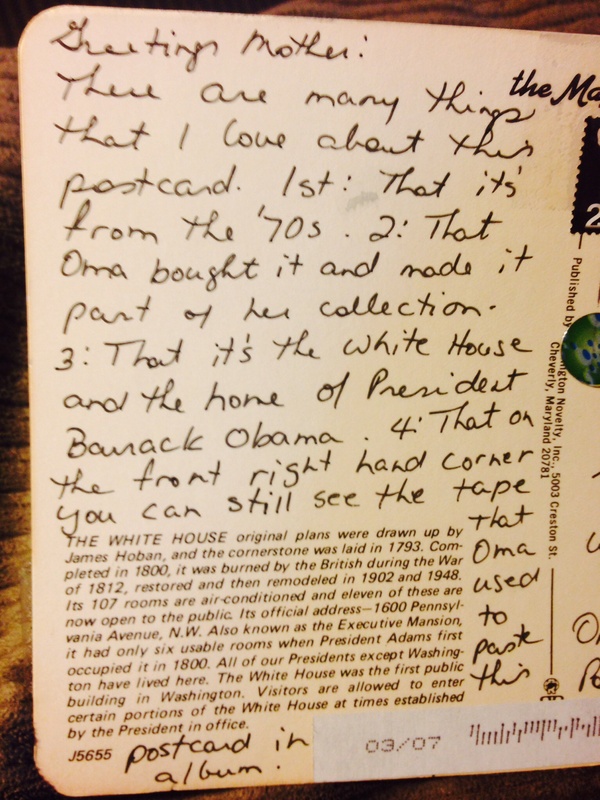 From all the postcards that I sent Mother, I’ve noticed one that was missing. I’m not at all surprised that it’s missing because I fully anticipated not ever seeing it again when I mailed it to her. But I just had to mail it to her… Just because! It was a postcard of a favourite President from my lifetime, Jimmy Carter. Actually, I’m quite surprised that the postcard you see above found it’s way back to me. The photo on the front is a picture of the White House by night. If you can make out my writing, you may understand why I feared for the life of this postcard. Once while flying home after visiting Mother, I had to change planes at Reagan Airport in Washington D.C.
Having about a two hour layover, I went through a few of the airport shops. I was pleasantly surprised to find a decorative Obama plate, and purchased it immediately. After leaving the shop I wanted to place it in my large handbag. This purse was purchased in Rome, Italy after I had been admiring it through a window across from our hotel for over a week. It was a deep lilac colour, only months old and in perfect condition. There was no warning, no tugging, no pulling, the zipper virtually fell apart in front of my eyes. …that God was a Republican. Further, I am very, VERY thankful that Mother wasn’t there to see my purse zipper break. She would have danced a happy dance that would have lit up the whole world. I second what Irmgard says. When my mother was still alive I sometimes had to sit thru Lawrence Welk reruns when I visited her, but that is nothing compared to having to sit thru hours of Fox News. No Fox News thank god but I did have to watch every single musical esp Jeanette MacDonald and Nelson Eddy many times over! I love Shirley Temple, really I do! But there’s a limit to how often I can hear her sing “On the good ship Lollypop”!